Primary ciliary dyskinesia (PCD) is an inherited autosomal-recessive disorder of motile cilia characterised by chronic lung disease, rhinosinusitis, hearing impairment and subfertility. Nasal symptoms and respiratory distress usually start soon after birth, and by adulthood bronchiectasis is invariable. Organ laterality defects, usually situs inversus, occur in ∼50% of cases. The estimated prevalence of PCD is up to ∼1 per 10 000 births, but it is more common in populations where consanguinity is common. This review examines who to refer for diagnostic testing. It describes the limitations surrounding diagnosis using currently available techniques and considers whether recent advances to genotype patients with PCD will lead to genetic testing and screening to aid diagnosis in the near future. It discusses the challenges of monitoring and treating respiratory and ENT disease in children with PCD. Cartoon of a respiratory cilium in transverse section as seen by transmission electron microscopy (TEM). 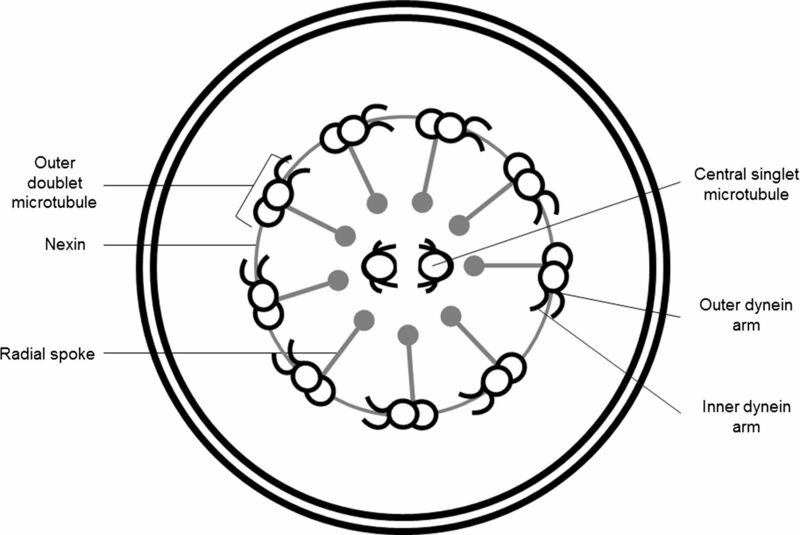 Respiratory cilia have a ‘9+2’ arrangement with a central pair of single microtubules running the length of the ciliary axoneme surrounded by nine peripheral microtubule doublets. Nexin and radial spokes maintain the organisation of the axonemal structure. Attached to the peripheral microtubules are inner and outer dynein arms that generate the force for ciliary beating. Abnormalities of the dynein arms affect ciliary beating. HYDIN projections on the central pair of microtubules are not usually seen by routine TEM (Cartoon image provided by Robert L Scott). Transmission EM of a respiratory cilia from (A) a healthy individual. Representative nasal epithelium cilia from patients with primary ciliary dyskinesia (PCD) caused by (B) outer and inner dynein arm defects (C) transposition defect: some cilia demonstrate absence of a central microtubule pair (‘9+0’); in other cilia a peripheral microtubule doublet has crossed to take the central position providing an apparent ‘8+2’ structure (D) microtubular disorganisation. EM images obtained using FEI Tecnai 12 transmission electron microscope (FEI UK Limited, Cambridge, UK) at 80 kV). EM images provided by P Goggin (Primary Ciliary Dyskinesia Centre, University Hospitals Southampton NHS Foundation Trust, Southampton, UK). Provision of PCD care varies across Europe. A survey of PCD management from 196 centres in 26 European countries showed that care was not centralised in most countries. There was a median of only four patients (IQR 2–9) per centre and management was very variable.10 The authors concluded that it was essential to standardise management and decrease inequalities between countries. In England, the Department of Health recently commissioned four national Paediatric PCD Centres to complement the existing diagnostic centres.11 ,12 The four centres, based in Leeds/Bradford, Leicester, London and Southampton, have been commissioned to provide an annual review by a multidisciplinary team of ENT and respiratory PCD specialists for children from England and Scotland plus additional service as outlined below (see ‘Management’ section). A high level of suspicion is required to ensure early diagnosis and start of appropriate management before irreversible lung damage sets in. Diagnostic investigations are complex, requiring expensive infrastructure and an experienced team of clinicians and scientists,12 thus tertiary respiratory centres play an important role, gatekeeping referrals and performing brushings for patients where travel to a diagnostic service is difficult. European consensus guidelines13 reflect a diversity of methods to support diagnosis, with no single ‘gold standard’ investigation. Paediatricians and neonatologists should have a low threshold to refer patients with symptoms suggestive of PCD (box 1) to a specialist diagnostic centre or to a respiratory centre for further evaluation. Neonates typically present with respiratory distress and rhinitis. Respiratory symptoms are present in 65–87%1 ,14 of neonates and range from mild transient tachypnoea to significant respiratory failure requiring prolonged respiratory support. Unexplained respiratory distress in term neonates, particularly if accompanied by atelectasis, should raise the suspicion of PCD. Although rhinitis is difficult to assess in neonates, in the authors’ experience, many parents report that a blocked nose was a problem from soon after delivery. Who should be referred for diagnostic testing? NB: A lower threshold for referral should be considered if the patient is from a consanguineous background or is of an ethnic origin known to have increased prevalence of PCD. Infants typically have a persistent wet cough and recurrent respiratory infections, which continue throughout childhood and adulthood. Due to the underlying pathology, the cough is almost invariably wet and is present on a daily basis unless suppressed by the patient. In the authors’ experience, such suppression is common, as is under-recognition of the symptoms that have been present since birth by parents. Bronchiectasis can present in infancy and is almost invariable by adulthood,1 predominantly affecting the lower and middle lobes. Persistent rhinitis occurs in most PCD patients,14 and symptoms of sinusitis often develop in childhood. Many patients suffer from glue ear associated with conductive hearing difficulty, which often fluctuates although it can be persistent. Situs anomalies occur in ≈50% of PCD patients, and these may be associated with congenital cardiac disease.2 Patients with situs anomalies should be referred for diagnostic testing if they have any additional features suggestive of PCD, for example, ear disease or wet cough. Respiratory symptoms in patients with complex cardiac disease associated with heterotaxy might erroneously be attributed to their cardiac condition; a very low threshold for referral for PCD diagnostic testing is important in this patient group, particularly as a diagnosis of PCD impacts on perioperative management and prognosis.15 The incidence of situs anomalies in the general population is approximately 1:10 000, but there have been no studies to determine how many of these people have PCD; a widely quoted estimate is 25%. The structure of the sperm flagella is similar to the ultrastructure of cilia, accounting for the common association of male infertility with PCD while women with PCD can be subfertile due to impaired ciliary function in the fallopian tubes. Assessment of ciliary ultrastructure by transmission electron microscopy (TEM) was previously considered the ‘gold standard’ test for PCD, and remains an important investigation. At least 100 cilia from healthy areas of epithelium obtained by nasal or bronchial brush biopsy are analysed in transverse section.24 Nasal ciliated epithelial cells can be obtained by rubbing a cytology brush along the inferior turbinate in a procedure that is uncomfortable but lasts only a few seconds. Tertiary respiratory centres can take the samples and transport the cells in culture medium and fixative to a diagnostic centre for analysis. 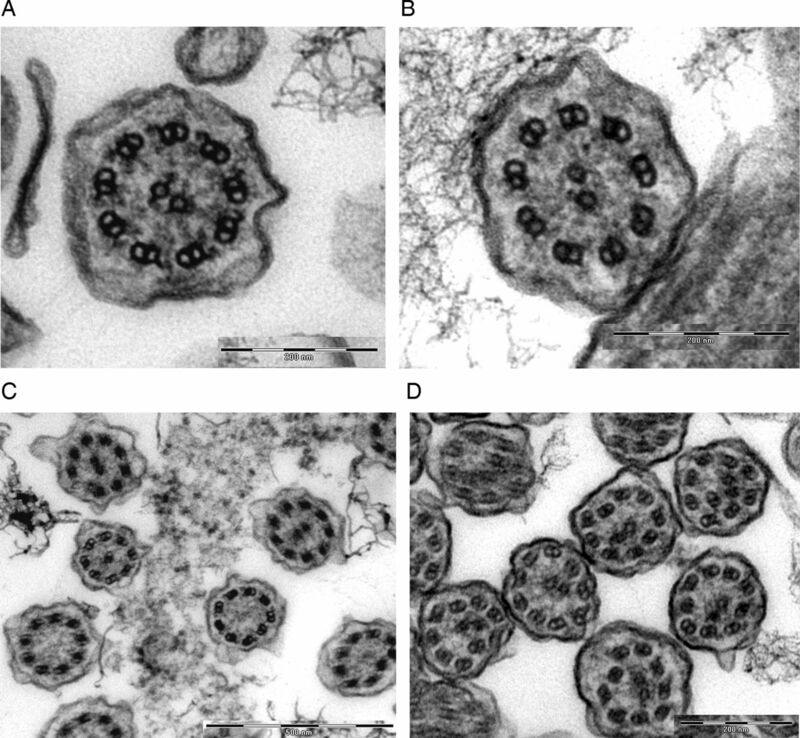 Respiratory cilia consist of nine microtubule pairs surrounding a central pair of singlet microtubules (figures 1 and 2); this gives a cross-sectional 9+2 pattern. Microtubule-associated proteins responsible for ciliary beating include inner and outer dynein motor ‘arms’ that generate ATP-powered coordinated microtubule sliding. Radial spoke and nexin–dynein regulatory complexes work together with the central pair microtubules to regulate the dynein activity to govern the force and waveform stroke pattern of cilia. Ultrastructural defects causing PCD include absence of the outer dynein arms from the outer doublets, missing central pairs and disarrangement of the microtubules (figure 2). However, 3–30% of patients with PCD are reported25 ,26 to have uncertain or normal cilia ultrastructure, thus TEM cannot rule out PCD. Assessment of ciliary beat frequency (CBF) and ciliary beat pattern (CBP), from a brush biopsy of epithelium, can exclude a diagnosis of PCD if both are normal. Cilia are observed by high-resolution, high-speed video microscopy with slow-motion-replay.27 Abnormalities of CBP include static, slow, rotating and hyper-frequent cilia with an incomplete beat, and these dysmotile patterns are often linked with specific TEM defects.28 Abnormalities of CBF, CBP and TEM can occur secondary to infection or inflammation of the epithelia; therefore, reanalysis of the CBF, CBP and TEM following culture of the epithelial cells at an air–liquid interface (ALI)29 with re-differentiation of cilia is used to eliminate secondary defects. Thus, a combination of techniques including nNO, CBF, CBP, TEM and culture at ALI may all contribute to a diagnosis of PCD, but despite expert evaluation, results can remain inconclusive and repeated testing is often required. Investigations providing additional information include radioaerosol MCC30 ,31 as an in vivo measure of ciliary function and immunofluorescence-labelled antibodies32 to demonstrate absence of cilia axonemal and cytoplasmic preassembly of proteins. EM tomography may be of assistance in identifying the ultrastructural defect where standard tomography has not resolved the abnormality.33 However, MCC, IF and EM tomography are only available in a few centres around the world and are not included in the diagnostic service commissioned in the UK.12 Recent advances to identify the genes associated with PCD provide hope for genetic testing as an addition to diagnostic testing. It is currently estimated that genetic testing can detect 65% of patients with PCD,17 and genetic testing is increasingly used as an adjunct test, particularly for difficult-to-diagnose cases with undetermined TEM or CBF studies and/or unusual clinical characteristics (see ‘Genetics’ section). There have been no long-term randomised trials of therapy in PCD, and there is a lack of evidence-based medicine in the management of this condition. As a result, many aspects of patient care are empirically based on other chronic suppurative lung disease, particularly CF.4 Best practice guidelines from specialist centres managing large cohorts of patients have recently been reviewed and collated to produce a European consensus;13 however, wide variations in approach to management exist.10 Despite many aspects of the care of the two diseases overlapping, PCD should not be managed alongside CF. The multisystem aspects of PCD differ from and require different subspecialist input,9 and these needs may be ignored in the CF setting. Nonetheless, a similar mind set of regular review in a specialist centre, with targeted multisystem care, and an aggressive approach to airway clearance and management of infections, should provide the cornerstone of therapy. The UK model11 includes comprehensive evaluation by the MDT PCD service at least once a year culminating in a personalised management plan. Depending on clinical and geographical factors, the patient may have additional appointments throughout the year by the PCD service or care may be shared with the patient's local specialist respiratory team. Appointments are scheduled to provide three monthly assessments. A telephone advice line is available to patients, their families and to professionals involved in the patient's care. Following diagnosis, the goals of respiratory management are the initial improvement of any lung function deficit and subsequent limiting of disease progression. Treatment of lung disease is based upon airway clearance therapy and aggressive antibiotic. Age-appropriate daily ACT should be prescribed for every patient and regularly reviewed. No individual technique has been shown to be superior and a patient's physiotherapy plan should be individualised, with adjuncts incorporated if appropriate. ACT can be augmented with bronchodilators, exercise, mucolytics or mechanical cough assist, although there is paucity of evidence for their use. Regular salbutamol inhalation pre-physiotherapy is of unproven benefit. Physical exercise encourages secretion clearance as well as providing obvious general health benefits. Nebulised mucolytics remain unproven as a treatment and can be expensive and time-consuming. There are anecdotal reports that rhDNase is beneficial in some patients, but a study of adults with non-CF bronchiectasis showed it to be ineffective and potentially detrimental.34 ,35 Oral N-acetylcysteine has been shown to have no benefit in patients with PCD.36 Based on evidence from bronchiectasis of other aetiologies, hypertonic saline may be helpful. Respiratory tract infections should be treated promptly and aggressively. A prolonged course of high-dose oral antibiotics can be prescribed in the settings of worsening respiratory symptoms, a deterioration in lung function or a positive culture. Culture-independent analysis of PCD respiratory samples has shown the bacteria present in PCD patient's airways to be plentiful and varied.37 The most commonly cultured pathogens are Haemophilus influenzae, Staphylococcus aureus and Streptococcus pneumonia. Pseudomonas aeruginosa and non-tuberculous mycobacteria have also been reported, although predominantly in adults.1 ,37 Intravenous antibiotics can be used if there is no response to oral antibiotics. Patients with more severe lung disease may require three monthly intravenous antibiotics to limit disease progression. Isolates of P aeruginosa are treated with eradication protocols based on those used in CF, and chronic infection is often treated with long-term nebulised suppressive antibiotics. There is no evidence for or against the use of antibiotic prophylaxis; however, in children requiring frequent courses of antibiotics, they can be considered. Children with coexisting asthma can be treated with β2 agonists and inhaled corticosteroids in line with asthma guidelines, but there is no evidence for anti-inflammatory treatment in other settings. Tobacco smoke exposure is likely to be harmful, and effective support for smoking cessation should be offered to families. Childhood immunisations should be administered along with pneumococcal vaccination and annual influenza vaccination. Finally, surgical intervention for lung disease in PCD is generally not recommended; however, in selected cases of severe, localised bronchiectasis, lobectomy can be considered. Bilateral lung transplantation is an option for end-stage respiratory failure. Monitoring the progressive lung disease in PCD is difficult on many fronts. Clinically, patients appear well, or report feeling fine, while objective tests might suggest otherwise. Despite retained secretions and a history of chronic productive cough in most patients, clinical examination may reveal few signs. For this reason, patients with PCD should be regularly followed up by experienced specialists who have access to an array of monitoring tools to assess their airway disease. In the UK model, English and Scottish patients have a comprehensive assessment as part of their annual review by the PCD multidisciplinary team. Monitoring throughout the year is conducted wherever the patient has their shared care, but access to specialist monitoring by the PCD centre is available between annual reviews if required. Spirometry remains the first line in monitoring lung function, although it has recently been shown to be an insensitive marker of deterioration of respiratory health in PCD. Progression of lung disease, evident using high-resolution CT (HRCT), has occurred while spirometric values have remained stable in some patients.38 Although HRCT remains a useful staging test, it is an impractical screening tool and efforts are underway seeking to establish an affordable, readily accessible and reproducible test to assist in the monitoring of PCD lung disease. Multiple breath washout technique, or lung clearance index (LCI), is likely to have potential as such a tool in specialist centres. It appears more sensitive than spirometry and correlates well with HRCT in CF. It is possible to test LCI in younger children compared with spirometry, and in established laboratories it can be done at each clinic visit if required. However, unlike in CF, a recent study comparing LCI and HRCT scores in a cohort with PCD showed no correlation between these measurable parameters,39 leading to speculation that the dissimilarities between large and small airways disease in CF and PCD may be one explanation to the different outcomes seen in these two important causes of chronic suppurative lung disease. Poor MCC of the upper respiratory tract leads to mucus pooling within the middle ear cleft, nose and paranasal sinuses. This results in a high incidence of otitis media with effusion (46–86% of patients), hearing loss (25–36%) and nasal discharge or blockage (76–88%).6 ,14 ,24 Where one would normally expect resolution of glue ear and nasal discharge in an otherwise healthy child by 8 years, symptoms in PCD children persist longer and not infrequently into adulthood. The main ENT concern is persistent hearing loss that is linked to otitis media with effusion. The role of ventilation tubes (VT) is controversial. Most reports advise avoiding VTs as they simply divert the mucus flow through the ear drum causing longstanding mucopurulent discharge.13 ,14 ,40 ,41 Hearing loss therefore tends to be managed conservatively with hearing aids, educational support for hearing issues and, where appropriate, speech therapy. Several reports challenge this, claiming good hearing restoration following VT insertion with episodic discharge causing no greater burden than in non-PCD patients.42–44 Should tympanic membrane perforations develop (particularly after repeated VT insertion), tympanoplasty is generally successful, but the glue ear often reoccurs. Nasal symptoms usually manifest as persistent nasal discharge and blockage. Nasal polyposis in childhood is rare. Nasal discharge is best managed by irrigation. Prophylactic antibiotics help minimise infective rhinosinusitis. Rarely is sinus surgery necessary or found to be effective in reducing nasal discharge. The sphenoid and frontal sinuses can be hypoplastic or even aplastic.45 There is no proven role for the use of intranasal steroids or antihistamines, but they are useful in treating any additional allergic rhinosinusitis. The role of adenotonsillectomy in removing any reservoir of infection is yet unproven. Obstructive sleep apnoea and sleep-disordered breathing are greater in PCD than in the general population, but neither have been found to be directly linked to increased adenotonsillar hypertrophy. Dynein arm defects (outer and/or inner) are the most common ultrastructural defect, with microtubule, central pair and other defects accounting for fewer cases.26 DNAH5 mutations cause ∼50% and DNAI1 mutations cause ∼10% of outer dynein arm defects, while SPAG1 mutations cause ∼10% of inner and outer dynein arm defects.46–48 Together, CCDC40 and CCDC39 mutations account for ∼70% of PCD with microtubular disorganisation and inner dynein arm loss.49 Mutations in other genes are rarer causes of PCD, and a large proportion of disease is not yet genetically defined.17 More difficult-to-diagnose cases, for example, those that do not have visible axonemal defects, are now also being diagnosed genetically17 ,33 ,50 (table 1). New next-generation sequencing (NGS) approaches are proving efficient for diagnosis and also identification of new PCD genes since they allow parallel sequencing of multiple candidate genes or of the entire exome.51 Technical developments will continue to improve affordability, coverage and sequencing quality of NGS approaches. Although NGS is not yet in routine use for PCD diagnosis, it already presents a cost-efficient and effective gene diagnostic approach. A diagnostic gene panel service has just been initiated within the North Thames Regional Genetics service provided at Great Ormond Street Hospital. This quick and comprehensive DNA-based diagnosis can help facilitate the earlier diagnosis and interventions desired to help patients with PCD, also providing diagnosis of PCD in cases that proved very difficult without molecular testing.33 Improved genetic diagnosis and determination of genetically stratified patient populations will be the first step required to evaluate future gene-based therapy strategies in PCD, for example, gene replacement therapy, aminoglycoside-induced read-through therapy and pharmacogenetic approaches of the type proving successful in CF. PCD is a genetically inherited disease with multisystem involvement, with mutations in 27 genes identified to date. There has been considerable international collaboration in recent years to improve our knowledge of the syndrome and to improve the evidence base for diagnosis and management. Currently, diagnosis remains uncertain in many cases, and management is largely based on evidence from CF. To improve management of PCD, a European funded FP7 collaboration is focusing on improving diagnosis and treatment (http://www.bestcilia.eu/). Paediatricians, neonatologists and ENT surgeons should maintain their awareness of PCD and make early referrals for diagnosis before the child has sustained irreversible lung damage. It is anticipated that multicentre collaborations will improve the evidence base for treatment. The National PCD Service is commissioned and funded by NHS England. The PCD centres in Southampton and Royal Brompton Hospital receive research funding from EU-FP7 funded BESTCILIA 305404. Research in Southampton is supported by NIHR Southampton Respiratory Biomedical Research Unit and NIHR Wellcome Trust Clinical Research Facility. HMM is funded by Action Medical Research (GN2101) and the Milena Carvajal Pro-Kartagener Foundation.
. Primary ciliary dyskinesia: diagnostic and phenotypic features. Am J Respir Crit Care Med 2004;169:459–67.
. Congenital heart disease and other heterotaxic defects in a large cohort of patients with primary ciliary dyskinesia. Circulation 2007;115:2814–21.
. Factors influencing age at diagnosis of primary ciliary dyskinesia in European children. Eur Respir J 2010;36:1248–58.
. Primary ciliary dyskinesia. In: Courdier J-F, ed. Orphan lung diseases. European Respiratory Monograph, 2011. 201–17.
. High prevalence of primary ciliary dyskinesia in a British Asian population. Arch Dis Child 2010;95:51–2.
. ENT manifestations in patients with primary ciliary dyskinesia: prevalence and significance of otorhinolaryngologic co-morbidities. Eur Arch Otorhinolaryngol 2011;268:383–8.
. Differences in disease expression between primary ciliary dyskinesia and cystic fibrosis with and without pancreatic insufficiency. Chest 2014;145:738–44.
. Lung function in patients with primary ciliary dyskinesia: a cross-sectional and 3-decade longitudinal study. Am J Respir Crit Care Med 2010;181:1262–8.
. Primary ciliary dyskinesia and cystic fibrosis: different diseases require different treatment. Chest 2014;145:674–6.
. Management of primary ciliary dyskinesia in European children: recommendations and clinical practice. Eur Respir J 2012;39:1482–91.
. Overcoming challenges in the management of primary ciliary dyskinesia: The UK model. Paediatr Respir Rev 2013.
. Diagnosing primary ciliary dyskinesia. Thorax 2007;62:656–7.
. Primary ciliary dyskinesia: a consensus statement on diagnostic and treatment approaches in children. Eur Respir J 2009;34:1264–76.
. Primary ciliary dyskinesia: age at diagnosis and symptom history. Acta Paediatr 2002;91:667–9.
. Increased postoperative respiratory complications in heterotaxy congenital heart disease patients with respiratory ciliary dysfunction. J Thorac Cardiovasc Surg 2014:147:1291–8.
. Nitric oxide in primary ciliary dyskinesia. Eur Respir J 2012;40:1024–32.
. Primary ciliary dyskinesia. Recent advances in diagnostics, genetics, and characterization of clinical disease. Am J Respir Crit Care Med 2013;188:913–22.
. Standardizing nasal nitric oxide measurement as a test for primary ciliary dyskinesia. Ann Am Thorac Soc 2013;10:574–81. American Thoracic Society; European Respiratory Society. ATS/ERS recommendations for standardized procedures for the online and offline measurement of exhaled lower respiratory nitric oxide and nasal nitric oxide, 2005. Am J Respir Crit Care Med 2005;171:912–30.
. Validation of a portable nitric oxide analyzer for screening in primary ciliary dyskinesias. BMC Pulm Med 2014;14:18.
. Hand-held tidal breathing nasal nitric oxide measurement--a promising targeted case-finding tool for the diagnosis of primary ciliary dyskinesia. PLoS ONE 2013;8:e57262.
. Diagnostic value of nasal nitric oxide measured with non-velum closure techniques for children with primary ciliary dyskinesia. J Pediatr 2011;159:420–4.
. Nasal nitric oxide is an important test in the diagnostic pathway for primary ciliary dyskinesia. Ann Am Thorac Soc 2013;10:645–7.
. Diagnostic testing of patients suspected of primary ciliary dyskinesia. Am J Respir Crit Care Med 2010;181:307–14.
. Ultrastructural expression of primary ciliary dyskinesia after ciliogenesis in culture. Acta Otorhinolaryngol Belg 2000;54:343–56.
. Twenty-year review of quantitative transmission electron microscopy for the diagnosis of primary ciliary dyskinesia. J Clin Pathol 2012;65:267–71.
. Analysis of ciliary beat pattern and beat frequency using digital high speed imaging: comparison with the photomultiplier and photodiode methods. Thorax 2000;55:314–7.
. Ciliary beat pattern is associated with specific ultrastructural defects in primary ciliary dyskinesia. J Allergy Clin Immunol 2003;112:518–24.
. Ciliated air-liquid cultures as an aid to diagnostic testing of primary ciliary dyskinesia. Chest 2010;138:1441–7.
. Pulmonary radioaerosol mucociliary clearance in diagnosis of primary ciliary dyskinesia. Chest 2007;132:966–76.
. Pulmonary radio-aerosol mucociliary clearance in primary ciliary dyskinesia. Eur Respir J 2014 in press.
. Immunofluorescence staining of ciliated respiratory epithelial cells. Methods Cell Biol 2009;91:123–33.
. Recessive HYDIN mutations cause primary ciliary dyskinesia without randomization of left-right body asymmetry. Am J Hum Genet 2012;91:672–84.
. Clinical benefit from nebulized human recombinant DNase in Kartagener's syndrome. Pediatr Pulmonol 1995;20:307–8.
. Treatment of idiopathic bronchiectasis with aerosolized recombinant human DNase I. rhDNase Study Group. Chest 1998;113:1329–34.
. The clinical effect and the effect on the ciliary motility of oral N-acetylcysteine in patients with cystic fibrosis and primary ciliary dyskinesia. Eur Respir J 1988;1:161–7.
. Complexity, temporal stability, and clinical correlates of airway bacterial community composition in primary ciliary dyskinesia. J Clin Microbiol 2013;51:4029–35.
. Progression of lung disease in primary ciliary dyskinesia: is spirometry less accurate than CT? Pediatr Pulmonol 2012;47:498–504.
. Lung clearance index and high-resolution computed tomography scores in primary ciliary dyskinesia. Am J Respir Crit Care Med 2013;188:545–9.
. Treatment of otitis media with effusion in children with primary ciliary dyskinesia. Clin Otolaryngol Allied Sci 1997;22:302–6.
. Hearing outcomes in children with primary ciliary dyskinesia--a longitudinal study. Int J Pediatr Otorhinolaryngol 2005;69:1061–4.
. Management of otitis media with effusion in children with primary ciliary dyskinesia: a literature review. Int J Pediatr Otorhinolaryngol 2009;73:1630–8.
. Otological manifestations of primary ciliary dyskinesia. Clin Otolaryngol Allied Sci 1997;22:266–70.
. Middle ear ventilation in children with primary ciliary dyskinesia. Int J Pediatr Otorhinolaryngol 2012;76:1565–8.
. Agenesis of paranasal sinuses and nasal nitric oxide in primary ciliary dyskinesia. Eur Respir J 2011;37:566–71.
. Mutations in SPAG1 Cause Primary Ciliary Dyskinesia Associated with Defective Outer and Inner Dynein Arms. Am J Hum Genet 2013;93:711–20.
. Mutations of DNAI1 in primary ciliary dyskinesia: evidence of founder effect in a common mutation. Am J Respir Crit Care Med 2006;174:858–66.
. Mutations in CCDC39 and CCDC40 are the major cause of primary ciliary dyskinesia with axonemal disorganization and absent inner dynein arms. Hum Mutat 2013;34:462–72.
. Primary ciliary dyskinesia associated with normal axoneme ultrastructure is caused by DNAH11 mutations. Hum Mutat 2008;29:289–98.
. Combined exome and whole- genome sequencing identifies mutations in ARMC4 as a cause of primary ciliary dyskinesia with defects in the outer dynein arm. J Med Genet 2014;51:61–7. Collaborators Southampton JS Lucas; WT Walker; A Burgess; HJ Evans; H Ismail-Koch; K Lock; A Harris; A Page; P Goggin; CL Jackson; JL Coles; J Thompson; L Behan; S Packham, K Gove, SA Collins. RBH CL Hogg, SB Carr, A Shoemark, M Dixon, S Ollosson, N Collins, M Bracken-King, A Roberts, G Marsh, A Carlton, K Kilpin, E Frost, A McKee, F Boswell. Leicester M Williamson; C O'Callaghan; RA Hirst; A Rutman; G Williams. Leeds/ Bradford PAJ Chetcuti; E Fernandez Moya; L Schofield; A Truscot. PCD Support Group Fiona Copeland. Contributors JSL led the planning and coordination of the writing and editing of the manuscript. JSL acts as guarantor for the manuscript. All authors contributed to the first draft of the manuscript. All authors, together with members of the national PCD service, provided comment and approved the final version. JSL and CH undertook the final editing of the manuscript.